Senate Majority Leader Mitch McConnell (R-KY) said Tuesday that twice-failed presidential candidate and former Secretary of State Hillary Clinton sent a very clear signal earlier Tuesday when she told CNN that it was time for Democrats to abandon civility. “Here’s what she said: ‘You cannot be civil with a political party that wants to destroy what you stand for. If we’re fortunate enough to win back the House and/or the Senate, that’s when civility can start again,’” McConnell said, quoting a portion of Clinton’s remarks. 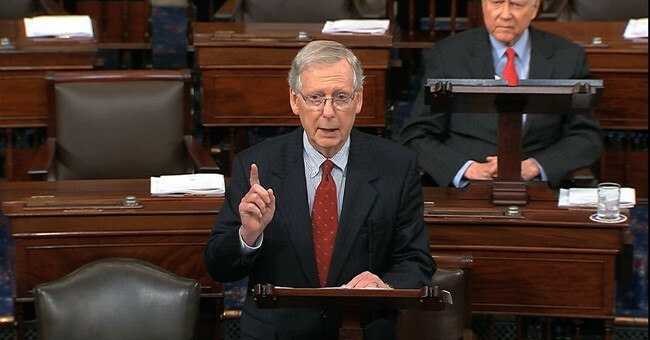 McConnell condemned the remarks, emphasizing that the Senate will not be intimidated. He added that far-left groups are looking to impeach Supreme Court Justice Brett Kavanaugh. "One far-left pressure group is already trying to circulate petitions that Justice Kavanaugh should be impeached,” he pointed out. During Kavanaugh’s confirmation process, GOP senators faced constant harassment from protesters, including at their homes and when they were dining out. Sen. Ted Cruz (R-TX) was chased out of a restaurant by protestors over his support of Kavanaugh. Sen. Susan Collins (R-ME), a key vote in the process, faced ugly threats over her decision. Rep. Steve Scalise (R-LA), who was shot at a Congressional baseball game practice last year by a man targeting GOP congressmen, joined in McConnell’s condemnation of Clinton’s rhetoric. Another Democrat joined Hillary in defending an abandonment of civility in the tactics of leftist groups. Sen. Mazie Hirono (D-HI) told CNN Sunday that the protestors were just “very motivated,” saying that "this is what happens."